Installerstore – Happy Thanksgiving Canada! Canadian Thanksgiving is celebrated on the second Monday of every October, and is unique from the US Thanksgiving. Canadian Thanksgiving not only comes earlier in the year than the US, but it came earlier in history as well. The very first Thanksgiving in all of North America was celebrated in 1578 in Newfoundland. During Martin Frobisher’s, an English explorer, voyage to set up a new English colony, his ships were scattered. He was eventually reunited with his fleet, and all those who had survived the storm celebrated their reunion with a day of thanks. French settlers of the 16th Century, led by Samuel de Champlain, would continue the feasts and days of thanks. In the following years, Canadians celebrated Thanksgiving almost annually, but they couldn’t decide whether to do so in October or November. To separate Thanksgiving from what would become Canada’s Remembrance day, and to bring the celebrations close to the true Canadian harvest dates, Parliament settled on the second Monday of every October as the official day of Canadian Thanksgiving. There are many similarities between American Thanksgiving and their Canadian counterparts. Like their Southern Neighbors, Canadians eat roasted turkey, stuffing, sweet potatoes and pumpkin pie. The recipes for pumpkin pie do differ between the two countries, with Canadians adding nutmeg, cinnamon and cloves to the recipe for a delicate spicy flavor. In many seaside provinces such as Newfoundland, seafood makes up a majority of the meal. But an outstanding theme for both countries is the overall family atmosphere and giving thanks for a wonderful meal and enjoying a few more weeks without winter. 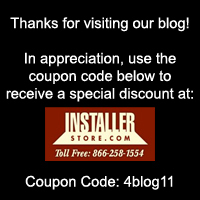 Happy Thanksgiving from all of us at Installerstore.com.